With 2Checkout, you can accept payments in any of eight payment methods, fifteen languages, and twenty six currencies. 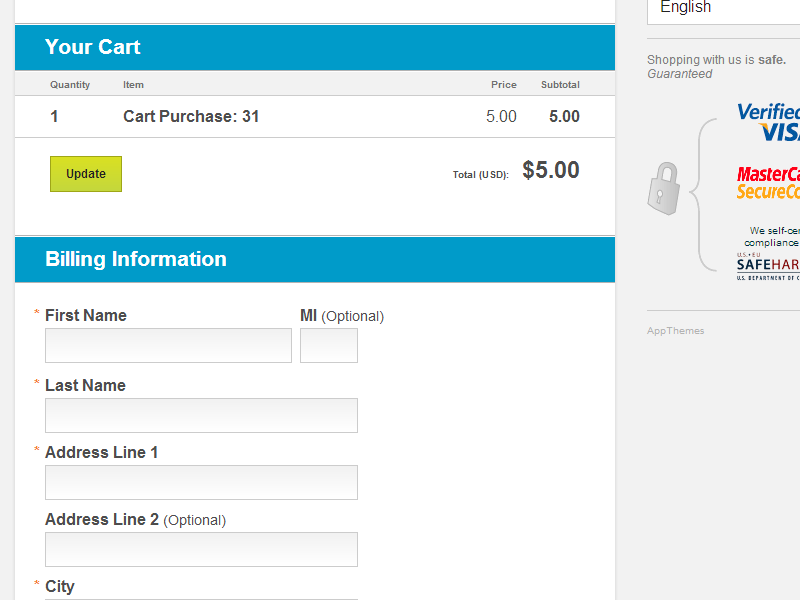 And now, you can start accepting payments via 2Checkout with your AppThemes website. Does not support recurring payments at this time. Accept Payments using methods like: Visa, MasterCard, Discover, American Express, PayPal, Diners and JCB. Allow Customers to view their checkout form in any of 15 different languages. Get Paid via Electronic Bank Transfer or Payoneer MasterCard in a variety of currencies. Customize Your Checkout Page to match your site. The 2Checkout Payment Gateway will work with any theme that supports AppThemes Payments. Currently this includes Vantage, Clipper, ClassiPress, and JobRoller. The problem is when I make a payment, instead of redirecting to my website and saying something like “payment succeeded” it redirects me, again, to the 2checkout webpage and ask me to make the payment one more time. This is very confusing to buyers as they will not know that their payment was successful although it will be, and in my website it will still note “payment pending” which is totally incorrect, because the payments are being made correctly. Does this support Moneybookers? I am looking for something that does. Sorry, Amir. Moneybookers (now Skrill) and 2Checkout are separate services and would require separate gateway plugins. We have do not have plans to create a Skrill gateway at the moment. I’d suggest voting for it in our Ideas Exchange ( https://ideas.appthemes.com/classipress/moneybookers-payment-gateway-option-1878 ). Can i use this plugin with ClassiPress Theme ??? 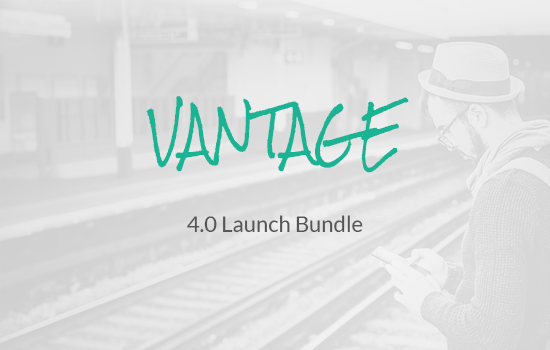 @Sahil, Currently this plugin is only compatible with the Vantage theme. We are looking at this for use with other themes in future, however for now, no it will not work with ClassiPress. Does this support jobroller now? @adil, It is still compatible with Vantage only at this stage, however if you are looking for additional payment gateways for JobRoller, you can find this as well as other payment options in the FXtender Pro plugin also available in the AppThemes marketplace. Thanks. @carson, Yes, but not all themes. As per the support information in the sidebar, this plugin “requires: 2Checkout Account, Vantage, WordPress 3.4+” Thanks. is this works with wordpress 3.5 and woocommerce? @geda, yes this plugin is compatible with the latest release of WordPress, and is currently only compatible for use with the AppThemes Vantage theme. Thanks. it will be compatible with classipress 3.3 ( updated payment process) ? @Mahdi Farhat, yes that is the plan, once the payments functionality in ClassiPress is updated in v3.3, this will allow compatibility with marketplace payment gateway plugins. Thanks. Well, but the problem with FXTender Pro is that it don’t work in payment gateways by buying job packs out from user account. In this case PayPal is the only gateway that’s provided. It’s really time to get also other payment gateways for this case. Because most users create an account first and try to buy job packs from their account. @trude76, If you have not already done so, please do post a thread in the relevant section of the forums here, and you will be able to communicate directly with the FXTender Pro plugin developer to discuss this further. The plugin itself has been updated so it may also be useful to download the latest version from your AppThemes customer dashboard as well. Thanks. 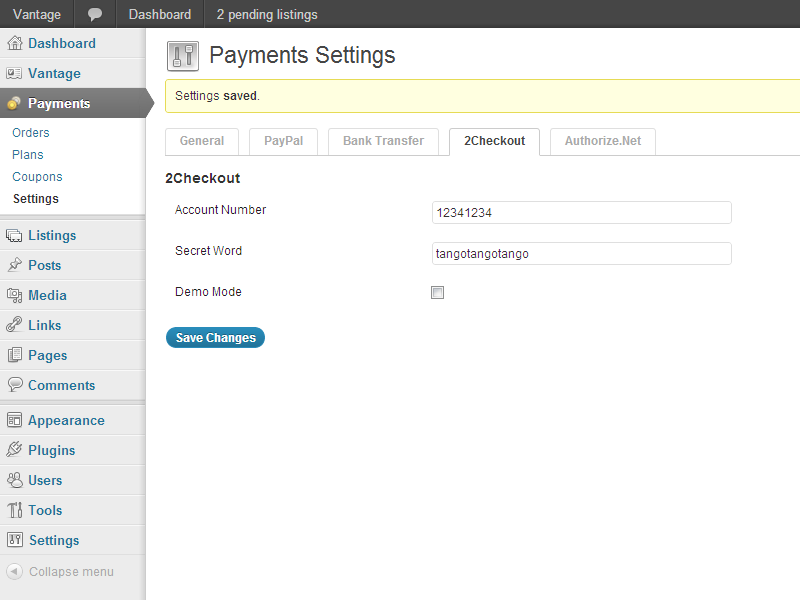 1) No, this and other payment gateway plugins are compatible only with ClassiPress v3.3 and above. 2) Recurring payments support has not yet been added to this plugin. Thanks. @Mahdi Ferhat, I don’t believe it does, but will check on this and report back. Thanks. Do you have any plugin or child theme which integrates CCAvenue payment gateway for classipress. @Bartech, not at this time. On a related note, we do have payment gateways documentation if you’re looking to create your own. Thanks. I have 2 pre-purchasing questions. 1-When a user makes a purchase, will they get redirected to a 2CO page? 2- Will the checkout have any 2CO brandings on my page (if it doesn’t redirect) or will it look like the checkout page is part of my theme? Hope last part made sense. @starahj, in answer to your questions: Yes, the user is redirected to complete the transaction on 2Checkout.com. Thanks. Hi I am having some problems with it. I am testing in Demo mode and after finalizing the transaction I return to my site and then it takes me back to 2checkout site. Please tell what am i doing wrong here. I have updated my site URL (www.salonaustralia.com.au) uisng Direct return (given links back to my site). @anuraagv, if you could please post a thread in our support forums here (where we provide all support for this product) our team will be more than happy to assist further. Thanks. which are the payment gateway works with classi press.. properly ..
@shareef the payment gateway marketplace products which indicate are compatible with ClassiPress, are able to be used. If you have already purchased the plugin and you’re experiencing issues, please do post in the 2Checkout.com plugin support forums where our team can assist. Thanks. Hi, I was really excited about this plugin to power the payment side of my new dual vantage and jobroller sites… That was until I saw it doesn’t support reoccurring payments. I don’t understand why not. 2checkout offer this service and honestly this would be a prime function of that kind of site; billing by the month, surely? Any plans on this being added and when will this be please? @hostpost, I’ll check with our team regarding possible future release dates. Thanks. Any update with regards to recurring payments being added on this plugin? I want to buy this plugin but would like to know if it supports recurring payment now that vantage does? Hi Team, I like this plugin for my classipress website but before buying it I want to know if it is able to receive visa or master card payments from India and other countries, my business and bank account is based in India and my main customers are from India only. so dose it allows to receive payments from India? @chanchalhada as per the “Currency” tab on the 2Checkout.com site, Indian Rupee is supported. Thanks. I am from India I have purchased HireBee theme none of Payment Gateway plugin Supports in India ,You have Pay U payment gateway for Poland ,Please launch Pay U plugin for India. Paypal and Skrill not Supports in India ,Other payment gateway you have also not Support in India ,I have invested a lot of money all of Wasted .Please launch Pay U payment gateway for India SO I can use your Hire Bee Theme I can do Setup If you launch pay U for India.Please Do it Soon ,I am willing to Know When you are going to launch payment gateway for India ? I am from India I am using Hire bee theme ,Is 2checkout Supports in India for Hire bee themes. There is a problem with the plugin. If the listing is expired and you want to renew it……..everything goes well, the payment is received, the listing is renewed, but the user is redirected back to the editing page instead to the order summary. How can be fixed this?